Conor McGregor Tickets – An Experience With Conor McGregor Live In Manchester! So if you have been following MMA then you no doubt are aware of the rise of “The Notorious” Conor Mcgregor in the UFC. 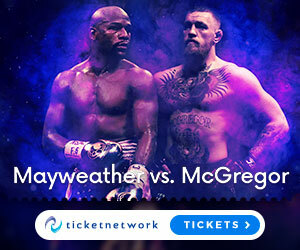 Now maybe your wondering where you can get tickets to speak to Conor directly yourself live and in person – well here at the MMAGateway, you can do exactly this, by booking your seat at the EventCity arena in Manchester, England on Saturday, January 28th, where Conor Mcgregor will be meeting and chatting with fans from all around the world. Whether you love him, hate him, or are indifferent – Conor McGregor has had a meteoric rise into MMA fame in recent years, this has been mainly due to his highly effective striking and his charismatic intelligence outside of the cage. Also his understanding of the business side of the UFC, in terms of being able to sell fights and maximise his purse/revenue share from the UFC owners, is without question the best in the history of MMA. • A WORLD EXCLUSIVE live on-stage interview with the one and only Conor McGregor. • The event will be filmed and produced by a large TV network, which will be the first of a new series of global showcases of ‘An Experience With’. • Over 1000 Black tie diners, surrounded by thousands of others in the stadium seating. • 5* top quality dinner and facilities. • There will be a Live Music act, promoting new chart single – artist TBA. • On stage, will be a comedy act from a social media sensation, again TBA. • An exhilirating Conor McGregor on-stage entrance. • The Big Band Orchestra State 51 with a Rat Pack singer, will be playing throughout the dinner for your enjoyment. • An exclusive and stunning auction with signed bespoke McGregor memorabilia, where there will be something for every budget. • HUGE production with unseen Conor McGregor video and photos, which will be shown throughout the interview on giant screens. • There will be a celebrity interviewer, which is TBA. • If you would like a professional Photo and Meet and Greet, then there is upgrade opportunities for this. • Chances to WIN loads of Conor McGregor related prizes, in the events Prize Draw. • Then to round of the night, there will be an Official After-Party ‘Notorious After Dark’ at the purpose built nightclub inside the Event City arena, more details TBA. • MEN– This is strictly Black Tie, there will be allowance for Black Shirts, Dickie Bows are not compulsory. The dress code applies to all dinner tickets. Those in tiered seating MUST still dress smart-casual. Bear in mind that failure to keep to the dress code policy for this event, will result in EventCity arena door staff refusing you entry to the event. So now you know where its going down and how its going down, lets be realistic – if your a fan of MMA, then anytime you get an opportunity to meet one of the most fascinating and influential fighters in the UFC today in Conor McGregor, and get some amazing food, drinks, music, event spectacles and services at the same time, well then there’s no doubt you need to be at the EventCity arena on January 28th. Stay tuned at the MMAGateway as we have more information on future MMA events coming out soon – Feel free to drop some comments, questions and feedback below, because I will always be in touch, and your feedback is crucial in continuing to build content to your liking. McGregor is not my favorite fighter but he is definitely an entertainer and can back his words. It would be a great time to meet him as i’m sure I would be entertained. Any information on events like this in the United States? Also any information on other fighters doing such meet and greats?